France is the most popular Alpine country for British skiers and snowboarders. It took advantage of being comparatively late to join the pantheon of ski nations. Unlike Austria and Switzerland, where skiing evolved gradually from mountain villages, France didn’t build many of its most famous resorts (such as Les Arcs, La Plagne and Avoriaz) until the 1960s, so it was possible to select the highest, most snow-sure places to ski in France. However the initial high-rise “space-age” architecture began to fall as the decades unfolded and during the 21st century there’s been a trend to build any new accommodation in a more rustic, sympathetic style alongside the original concrete towers. There are of course some traditional French ski resorts, the upmarket resort of Courchevel is another area that blossomed early in the history of French skiing. Courchevel is a key gateway to the vast area of the 'Les Trois Vallées (The Three Valleys) which is arguably the biggest linked ski region in the world. Its only rival is the Portes du Soleil network of ski areas (with Avoriaz and Morzine at its heart) which spreads across the French border into Switzerland. The Three Valleys is dominated by four major resorts: Courchevel, Méribel, Les Menuires and Val Thorens – the highest ski resort in the Alps. Each of these four resorts has more than enough terrain to keep a skier or boarder happily occupied for a week or more during a skiing holiday in France, so the opportunity to ski all four provides unlimited permutations. In the Portes du Soleil, neighbouring Avoriaz and Morzine are gateways to a dozen or more family ski resorts in France and Switzerland. Chamonix, dominated by the Mont Blanc Massif, is another major attraction with several resorts scattered along the valley, including Argentière, rated by some keen off-piste skiers and boarders as one of the best ski resorts in France - or the entire Alps for that matter. They will also be keen to try the Vallée Blanche – a classic off-piste descent - with a high-mountain guide. The traditional route is not seriously demanding, leaving skiers to concentrate on the outstanding scenery, but a guide will help negotiate the occasional crevasse. There are a handful of more demanding alternative routes including the Vraie Vallée Blanche and the Envers du Plan. Another resort overlooked by the imperious Mont Blanc is Flaine, linked with a handful of sibling resorts, with some of the most extensive slopes in France. That’s even more true of the Espace Killy – the linked areas of Val d’Isère and Tignes - named after the celebrated Olympic triple-gold medallist Jean-Claude Killy. Together these neighbouring resorts provide some of the most exciting skiing in France, particularly for off-piste enthusiasts. Tignes has the added advantage of regular glacier skiing on the Grande Motte glacier. Two more giants of the French skiing world which are joined at the hip and undoubtedly among the best family ski resorts in France are La Plagne and Les Arcs. They’re celebrating their 10-year-partnership as Paradiski, made possible by a huge cable car linking the resorts which opened in 2003. La Plagne has a dozen or so linked hamlets and villages spread across slopes in all directions, while Les Arcs too, like Courchevel, has a handful of ski villages and satellite resorts at various altitudes. Further south in the French Alps are two more favourites: Les 2 Alpes and Alpe d’Huez. And in the same part of the world, just as those in search of culture and impressive architecture in Austria are drawn to Innsbruck and Kitzbühel, one of the big attractions for ski holidays in France is the Serre Chevalier ski network, linked with the UNESCO world heritage site of Briançon and enjoy the wonderful Roman baths in Montier. We are very excited to include the resort of Montgenèvre this winter. Also taking advantage of flights into Turin, the transfers are short and our guests have the opportunity to ski in both France and Italy during their stay. Montgenèvre also boasts some of the best snow conditions in the French alps, collecting snow from both it's Italian and French neighbours depending on which way the weather arrives from! The combined resorts of Val d'Isère and Tignes produce a formidable ski area which stronger skiers and snowboarders will get the most from. The region is named after the celebrated Jean-Claude Killy, who grew up in Val d'Isère, dominated skiing in the late 1960s and won three gold medals at the 1968 Grenoble Olympics. Set high in the Tarentaise region of the French Alps, the slopes of Les Arcs and La Plagne – each already famously large areas in themselves - were joined a few years back to create one of the largest lift-linked ski areas in the world. As one of the largest ski areas in the world, the Three Valleys provides high altitude, world-class skiing, as well as a guarantee of great snow all season long, from November to May. The area links four fabulous French resorts - Europe's highest (Val Thorens), the ultimate chalet resort (Méribel), iconic Courchevel and Les Menuires. 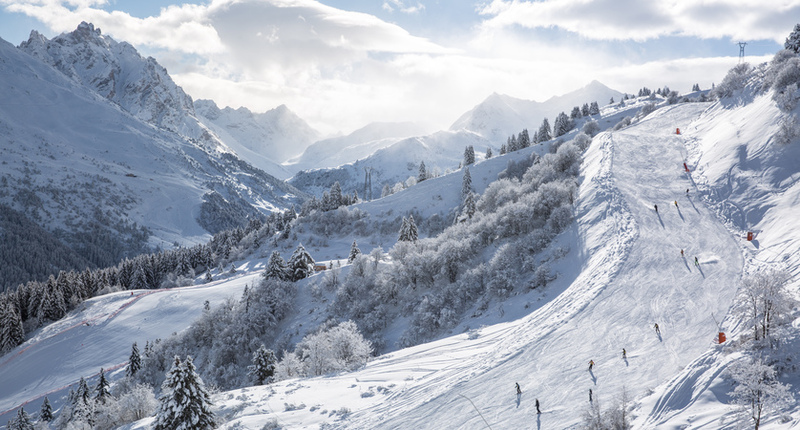 With claims to being the largest lift-linked ski area anywhere in the world, the huge Portes du Soleil area offers a seemingly endless expanse of runs and no less than 14 individual resorts to explore. The Milky Way is an international ski area linking Montgenèvre in France with Sestriere, Sauze d'Oulx, Sansicario, Cesana and Claviere in Italy. Hosting the 2006 Winter Olympics here meant that the ski area was meticulously upgraded. A true skier's resort; high, totally snow sure, with high speed lifts and open pistes right around its huge, panoramic snow bowl. Tignes is the leader of non stop ski. With a resort height of 2,100m snow is always on the menu and anyone looking to improve their freestyle should definitely consider a week in Tignes - the half pipe is huge! A well established favourite for UK skiers, some come purely for its awesome range of challenging skiing. Others are more interested in the resort's well earned fame as an apres ski paradise. However, we believe most will simply revel in a resort that continually manages to combine both these strengths better than anywhere else in the ski world. A playful roller coaster of open runs and connected villages, La Plagne makes the most of all the terrain on offer. Individuals and families can stay in four of the villages, Plagne 1800 is a pretty village made up of chalets giving a quaint charm, Plagne Soleil is modern but perfectly placed on the piste above Plagne Centre and Belle Plagne has a traffic free village centre and attractive buildings made of local stone and wood. Arc 1800 is the largest centre and also home of the Mille8 complex with pool and ski play areas. It's also the closest centre to the Vanoise Express. Arc 1950 has a piste running through the middle and is inspired by the resort of Whistler and contains a development of high quality apartments, whilst traffic free Arc 2000 is home to a selection of catered chalets. Feel on top of the world in Europe's highest ski resort. Val Thorens is perfect for those who like the promise of guaranteed snow, combined with lively apres and a variety of accommodation. Perhaps France's most prestigious resort, Courchevel is the resort of choice for those in search of world class skiing and chic, lively apres ski. Beginners will have a great time here with green pistes groomed to perfection and lifts to neighboring resorts are within easy reach. For those seeking a central base in the world class Three Valleys area, Méribel offers the ultimate position. If proximity to the lifts is important our Chalet Hotel Les Grangettes fits the bill, not only in Méribel centre but also as our closest property to the Chaudannes ski lifts and ski school meeting point. Perfect for families and couples, Les Menuires is the best choice for those wanting real value for money and the ability to ski to and from the ski room without the temptation to party all through the night. The resort also boasts blue runs from all the lifts making it perfect for beginners too. Picturesque Morzine is an established favourite. This is due to an appealing and highly unusual mix of charming, traditional Savoyard village centre with easy access to a modern and truly enormous ski area. Only a short transfer from the airport, Morzine is ideal for families. A high, traffic free resort, at the heart of the Portes du Soleil. All our properties offer doorstep skiing making this resort a superbly convenient base from which to enjoy this fantastic ski area. 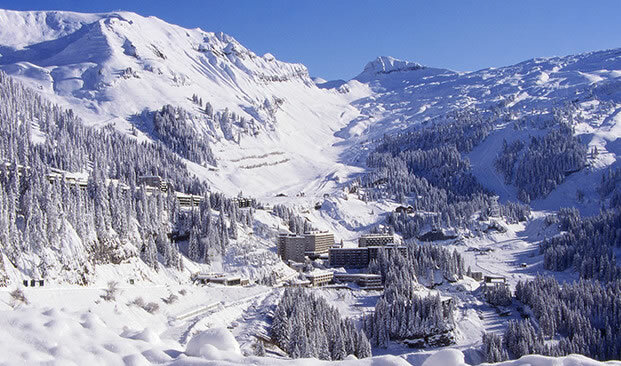 The architecturally unique resort buildings are designed to blend in with the surrounding rocky cliffs, giving Avoriaz a modern and unique feel. Serre Chevalier stands apart from other ski resorts. One of the sunniest locations in the French Alps the area offers some of the most extensive and unique tree skiing in Europe – suitable for all levels. Friendly locals and picturesque, historic towns and villages add to the charming atmosphere of this incredible resort. 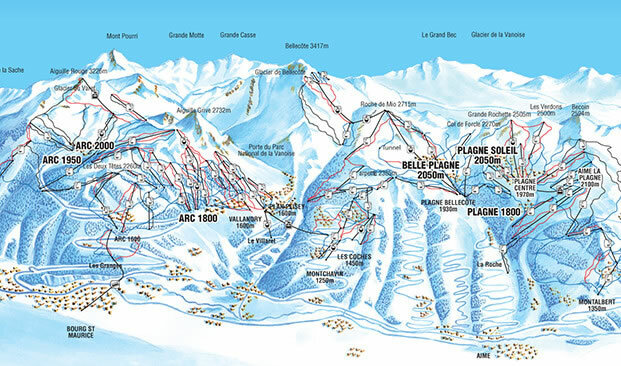 With 225km of pistes between 1,300m and 3,600m, Les 2 Alpes is ideal for all levels of skiers and boarders. Unusually, the higher the altitude, the easier the pistes. In fact, the glacier is ideal for beginners with a blue run taking skiers from the glacier right down to the resort. You could hardly wish for a more eclectic ski network than Alpe d’Huez. The resort and its satellites are on a sunny, high plateau surrounded by an amazing snow bowl with mile after mile of varied on-piste and off-piste opportunities. With much of the terrain above 2000m, the skiing in Chamonix valley has for many years attracted skiers looking for good snow and who also want to ski the famous Vallée Blanche - or tackle the rest of the extensive off-piste skiing. The mighty snow-bowl resort of Flaine with its incredible snow record is one of the best villages in the Grand Massif ski area. In the Haute Savoie, close to Geneva and Mont Blanc, the Grand Massif is an impressive network of exhilarating skiing and charming villages. The ski domain of La Clusaz is made up of five interlinked mountains, with excellent green and blue runs making this an ideal resort for confidence building beginners and families. You can also ski Le Grand Bornand with the purchase of an Aravis lift pass including the short bus ride between the resorts. Samoëns is the jewel of the Grand Massif, a traditional and beautifully preserved village linking to four neighbouring resorts to create a formidable ski area.